As a life coach, one of the common topics clients want to focus on is moving forward in their lives when something is holding them back. Their goals, dreams and ideas are like the rocks and leaves in the stream. The stream represents the flow of life events and experiences. The tree bark and leaves are the fears, mental blocks and false beliefs that appear to hold them back from moving forward. With coaching, I help clients become aware of all the paths in the stream of their minds they might not have seen. We discover ways to put a plan of actions in place to take action, grow and change. What’s holding you back from moving forward? Now is the perfect time to dive into the stream of change. into action and do some deep cleaning, de-cluttering and letting go! and tissues ready. The plan is to do this from the inside out. There is a connection between a cluttered mind and a cluttered home. Let’s start with the inside de-cluttering of the mind. How much stuff are you holding onto emotionally? After some time, we don’t even realize what thoughts are taking up room in our minds. Like dust, dirt and grime, things like resentments, unhealthy relationships and old beliefs can be wiped away. In turn, you will feel lighter, brighter and refreshed. feel the freedom from within. When we get rid of the emotional stuff holding us back, we make room for more energy and positive thoughts. Remember some of the old dreams that you buried deep in the back of the storage container in your mind? and turn those dreams into reality. still holding onto?” As it is revealed to you, allow it to come up. If it no longer servers you, let it go. Now lets spring into action on the outside. Your home environment usually reflects how we feel within. it can end up becoming an unproductive way to remind us of what needs to be done. If you have things to give away, donate or sell, do it fast. Don’t give yourself the option to change your mind. With the New Year only a few days away, I’ve been thinking about my goals for 2011. Yes, I make goals, not resolutions. I have found resolutions to be too open-ended. In the past, I lost focus and motivation when it came to my New Year’s resolutions. In fact, statistics clearly show that most people do not stick to their New Year’s resolutions beyond the first few weeks of January. Ever notice how jam packed the gym is the beginning of January? How about all of the people that are moody and barely have patience from starting their resolutions to give up smoking, caffeine and junk food? By February, many are left feeling frustrated and discouraged because they were not able to keep their resolutions. If this sounds familiar, you might want to set New Year’s goals instead. Do you know what your goals are for the New Year? There are many ways to come up with your goals. One of the tools that I use with my clients is the Life Assessment Wheel. It gives a snapshot of all areas of a person’s life. The Life Assessment Wheel shows the successful areas in your life and the ones that need to be improved. Another approach I use is to have clients envision a clean slate for creating new ideas and possibilities. Then we make a list of what comes up. That list is turned into goals that are achievable, measurable and in line with where you want to go. Many people find it beneficial to work with a life coach on their goals, so they are held accountable and stay on track. Managing your goals can feel overwhelming. There are some wonderful websites out there to keep everything in order. Some of the ones I recommend are Stickk, 43 Things, Remember the Milk, Zealog, SuperViva, Achievr, Goal Setting 1 and Life Tango. Whether the site calls it life tracking, personal metrics, important things to do or goals, these virtual tools are sure to be another helpful resource. The quality of your life has a strong connection with how healthy your relationships are with other people. Do you struggle to make other people see things your way? Well stop trying, because you can’t manipulate others. Why? Well, just like you, they are operating from their own map of the world. What you CAN do is develop a habit of paying attention to the positive aspects of your relationship. If you are distressed by your relationships, then you need to change the way in which you react to the behaviour of others. If you hold a belief that you will only be happy when the other person changes, it’s time to get real, because: The Buck Stops With You. Think about someone in your life; Are you paying attention to the qualities you think that person is lacking? For example, maybe you think: “If only he was tidier, more attentive to me, more loving, etc.”? Whatever you put your attention on expands. If you only notice the things that annoy you about others, or if you focus on what you think they are not doing right, then you will only experience more of the behaviour that you are trying to avoid! Try this exercise: Think about this specific person, and write down the qualities you admire in them. Take the time to remember what drew you to them in the first place. Maybe they are great at making you laugh. They could be a good listener, or have a talent for organising things and events. Whatever you like about this person, write it onto a list! And then look at this list every day. What About Those Things You Don’t Like? Okay, then. What really annoys you about others? Do you get upset by arrogant people? Or maybe people who cannot be assertive really make your blood boil. Whatever it is that bothers you, you must understand this: We criticize in others the very qualities that we dislike most about ourselves. Much has been written about forgiveness. Everywhere you turn people are saying you have to forgive, yet few people likely understand the process of true forgiving. For true healing, forgiveness is essential. The same holds true for the idea of compassion. Yet I have learned that going from anger straight to compassion does not bring about true forgiveness. 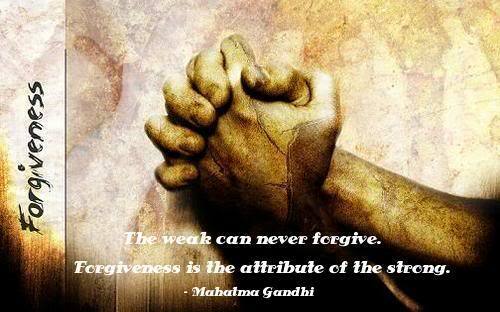 It only creates a sense of pseudo forgiveness. Many people try to go from hurt or anger straight to compassion. It most often fails unless they fully understand the deeper process. In most cases the shortcut backfires or they have only repressed their anger. While you maintain an air of forgiveness, you may find yourself easily triggered when speaking of the original event, or you find yourself reacting emotionally when the issue is raised. I have found that the following steps bring about lasting forgiveness when implemented and practiced on a daily basis. I’ve had many things to forgive, so I’ve had practice. I’ve noticed that it is easy to fall back into a trap of non-forgiveness and resentment unless you make it a daily habit to forgive. Why forgive? You forgive so that you can stop harming yourself through resentment and begin to move into a state of happiness and gratitude. Stage 1- Admit You Are Angry! Many of us will echo the thoughts “What? I’m not supposed to get angry! I’ve done all this healing work!” I’ve learned that it is harmful to get angry but it is more harmful to be angry and not admit it! The way to check if you are angry is to observe your inner dialogue about how you are relating to yourself and others. Are you finding yourself being negative, critical or frustrated? Do you find yourself being impatient with people and critical of how things are done? Are you constantly blaming others for your troubles, wishing that others would change? If so, then it is likely you are angry. Try to recognize what you are angry about. It may not be the little things, but something that happened months ago. Look back in time to what might have triggered your anger and where your expression has been blocked. Bitterness is anger with no outlet to be heard or feeling that you can not change anything. It is a form of helplessness. Try to discover what you are bitter about. Make a list of resentments. Don’t hold back or edit your thoughts. Being honest with yourself is the first step in healing anger. Stage 2- Acknowledge the Loss and Consequences In order to fully forgive, you need to look at the consequences of the event. By consequences, I do not mean just emotional pain. Look at the past and the present, and honestly note any changes. Were you physically injured? Were you emotionally hurt? Did you suffer financial loss? What other types of losses occurred? Was there harm to other relationships? To achieve lasting forgiveness it is important to acknowledge all the losses, otherwise forgiveness will have to be revisited. When listing the losses and consequences, try to look objectively at the incident without investing in the emotions around the losses at this time. Stage 3 – Submit to a Feeling of Vulnerability The next stage in forgiveness is to open your self up to change and dissonance. You can not spread butter when it is hard and cold. Forgiveness does not come easily when your ideas, thoughts of revenge or justice are hardened. You must retreat and re-examine your approach. Just like a pound of butter, if you want to forgive and heal, you need to let your ideas thaw and be molded into a new perspective, combined with other ideas and views. You need to admit that to harbor anger and resentments violates the laws of kindness and compassion both for yourself and other people. You must realize that in not forgiving, you are now betraying the person at whom you are angry. This is not an easy step. It can be painful to realize that it is you who needs to change, and that it is you who has the poison of anger and resentment. It is easy to build up a wall of justification around your thoughts, actions and feelings regarding the harm done to you. In order to heal and forgive, you need to break through the wall and tear it down completely! This stage of forgiveness also requires you look at whether there was any responsibility on your part. In some cases there was none, in some cases, you may have taken action which contributed to the decision. In this case, it may be hard for you to admit that you caused part of your own suffering as it is easier to blame others than to take any responsibility. This stage requires an honest, fearless, kind and moral inventory of your own actions and behavior. Sometimes you may not like what you find, but facing your shadow can be one of the most powerful healing experiences. See if you can find some common ground. Stage 4 – Stop Punishing One of the common behaviors of people is to try to punish those who have harmed us. Most studies have shown that punishment rarely teaches anything other than to resent the person doing the punishing! Some of the ways you may punish are by withholding companionship, giving someone the silent treatment, or even giving compliments but then taking it back with an insult. You may try to go further with legal action, or you may try to damage things that the other person prizes. Another method of punishment is gossiping about the other person. In order to truly forgive, you need to give up the expectation that the other person will be punished. You can ask that the other person make amends for their harm, but if they refuse or are unable to make amends, then releasing them from the idea of punishment frees you from lingering resentment. There is great wisdom in the following Buddhist teaching – “Should one person ignorantly do wrong, and another ignorantly becomes angry with him, who would be at fault? And who would be without fault?” It is far better to try to forgive, and reintegrate your friends back into community than to ostracize and alienate them through punishment. Try to practice compassion, work at developing a deeper understanding of how and why people behave. It seems that we prefer a simple explanation of things, yet you need to understand that human beings and the relationships between each other are complex. Understanding the ways of the world and the people in the world requires wisdom and self control. Use the opportunity to forgive as a means of growth! Stage 5 – Identify Some Good in the Other Person This step, finding some good in the other person is probably the most crucial step in bringing about lasting forgiveness. It can also be the hardest depending on the severity of the event you are trying to forgive. According to Francis Bacon, the key to forgiveness is in “not expecting the other to change, to give love, to be kind and develop the ability to see that in everyone else’s eyes and heart there is some good.” In forgiving, you try not to think of yourself as being good and the other person bad. You can find it easier to forgive if you can understand that the other person has difficulties too, or was harmed in the past. If you do not practice this step, then forgiveness will be futile because it will be done with a sense of contempt for the other person. If you can not find good in the other person, then at least pray for them. A wonderful technique for developing your vision of good in another is to imagine a seed of goodness in their heart, and in prayer imagine that both you and God are watering it to make it grow stronger. Better yet is to image that each person already has this great flower of goodness in them already. Admit that it has been obscured from your view because of your anger, resentment and justifications. Learn to look for the good. At first, like developing any skill, it is challenging. You will become better at it with practice! Stage 6 – Develop Genuine Neutrality Hopefully in the process of forgiveness you will come to resolve any negative emotions and thoughts about yourself and the other person or organization. To do so requires that you do not expect or demand any payment or restitution after forgiveness. You must assume that there is no debt owed to you. Mother Theresa once said “it is between God and myself, it was never between me and them anyway.” This must be practiced daily. It is easy to slip into anger and resentment if you do not cultivate a practice of neutrality. Depending on the severity of the event, you may choose to not have any further contact with the person, but if you meet them by chance, you want to have a sense of neutrality and a sense of calmness instead of avoidance. Stage 7 – Stay in the Present “Bury the hatchet” is a phrase you may have heard many times. There is wisdom to this phrase if you understand its original meaning. The phrase comes from spiritual traditions of North American Indians who would put all weapons out of site while smoking a peace pipe. For your own forgiveness work, you must keep the original wound out of sight, or out of present mind. It is necessary to acknowledge what happened, to not forget it, but also not drag it up again as a fresh wound. Resurrecting the event and bringing it up again with the person who harmed you will cause you to feel the associated feelings again. Balance your memory of the event with your memory of the forgiveness work you have done. Practice loving those you don’t feel warmth towards. All of your forgiveness work can be undone, and the resentment rekindled if you begin to dwell on the event again. If you begin to rerun your mind’s movie of the harm, then you may find yourself in an angry and hurt state again. It is the nature of your mind to ruminate, and therefore you must develop self-discipline and remind yourself that you have completed forgiveness work around this issue. Thank your mind for the intrusive thought, and send it off into the far reaches of the universe! Refuse to bring the past into the present again, as it will re-trigger you back into hurt and anger. Continually rise above the injury! Practice compassion and unconditional love towards all people! Back to Goals: How are those New Year’s resolutions coming along? Remember those? One of my resolutions was to get back into an exercise routine. So like the rest of America, I went back to the gym once the new year hit. It was going great for a couple months. Then it stopped. Hmmmm…As I write this, I am committing to myself to go back to my goal of exercising on a regular basis. I will make it a reality starting this week! What goals would you like to get back to? Back to Dreams: Anything is possible. We all had childhood dreams of what we wanted to be and where we wanted to go in life. What were some of your dreams? Have you followed any of them? When I was younger, I dreamed about being able to fly and have superhero powers. A couple years ago, I went skydiving. It was amazing! I’m still working on the superhero powers and will keep you posted. My point is that it is never too late to make some of those dreams come true. Back to your Authentic Self: Do you look in the mirror and not recognize the person you have become? Is your true self hidden behind layers, walls and masks you have used over the years to fit in and feel accepted? Now might be a good time to go back to your true authentic self.